Chicken Vindaloo is a Spicy and a tangy curry seasoned with loads of spices which is highly aromatic and tastes wonderful. The curry has got a nice bright red which makes the dish more appealing and appetizing. This recipe is from the Portuguese cuisine but however we Indians have modified the recipe to our taste preference. The dish originated in Goa and has extended all around Mumbai but now a days its has gained its popularity all over the world. Originally this recipe was made with pork but most of us doesn't eat pork so we have re modified the recipe with chicken and introduced Chicken Vindaloo. Lets start with making a special marinade for our chicken, In a blender add 10 Kashmiri chilies (Kashmiri chilies imparts nice bring red color to the recipe and at the same time they are less spicy) if you are using regular red chilies then reduce the amount of chilies to 6,add coriander seeds , cardamom, Cloves, cumin seeds, pepper corns ,garlic ,ginger, vinegar, turmeric powder, onion and grind it to a smooth paste. in a bowl add the chicken pieces with bones (medium sized pieces, do not cut too small), add salt and coat the pieces nicely with the masala mixture and set it aside and let it marinate for minimum 20 -30 minutes. Heat oil in a pan and add bay leaves and cinnamon stick. Give it a stir and add the marinated chicken pieces and cook for 2 minutes. After 2 minutes add enough water , salt and mix well. Let it cook for 15-20 minutes on a medium heat. Finally add a small piece of Jaggery or a tsp of sugar to balance the taste. This is purely optional. You can skip if you dont like the taste of Jaggey. Since we have added vinegar i have skipped tomatoes, because the sourness to the curry will be given by vinegar, if we add Tomatoes then the curry will become too sour . Our Chicken Vindaloo is ready to be served with any of your favorite dishes. This curry tastes so good when consumed after 2-3 hours of resting. The chicken will absorb all the flavors from the curry and will have a wonderful taste. Use big or medium sized pieces for the curry otherwise the chicken will become too hard. Spread the Joy of cooking. 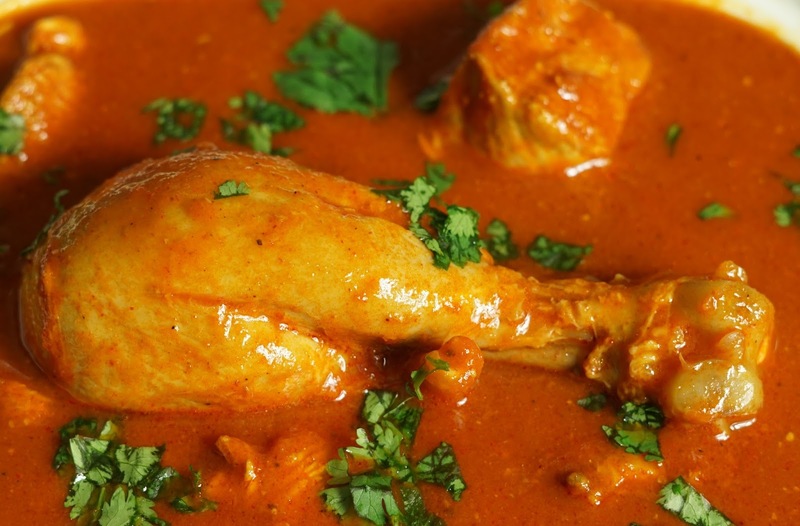 Chicken Vindaloo is a recipe from the Portuguese Cuisine which is very famous in Goa and around Mumbai.This recipe is a spicy , Tangy curry made with Onion, chilies , vinegar and Garlic which makes the dish more appealing. Grind all the ingredients stated below " for grinding"
Add enough water, salt and cook for 15-20 minutes. Our chicken Vindaloo is ready to be served. I have tried this and the chicken vindaaloo was really delicious.....my husband and family members are happy too...the recipe is very simple to try at home....thank you. Thank you so much for sharing your feedback Monalisa, I am glad that your family members liked the recipe. Happy COoking !! !